Gibbard And Farrar Take On Kerouac's 'Big Sur' An unlikely pair has come together to interpret the words and atmosphere of Jack Kerouac's autobiographical novel. Benjamin Gibbard (of Death Cab for Cutie) and Jay Farrar (of Son Volt and Uncle Tupelo) have both found inspiration in Kerouac's prose, creating a song cycle with country tinges. Benjamin Gibbard on staying in the same Big Sur cabin as Kerouac. 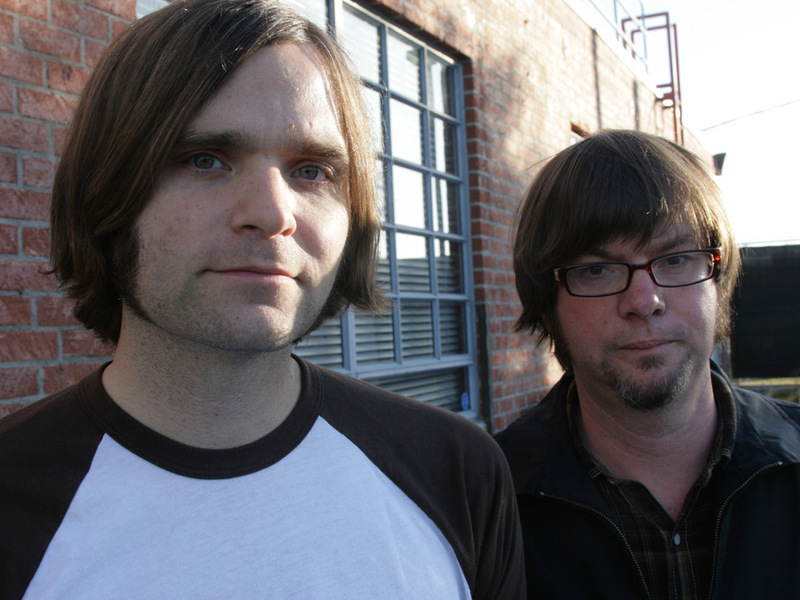 Jay Farrar and Benjamin Gibbard on Gibbard's favorite song from the album, "Willamine." Jay Farrar (right) says 90 percent of the words recorded on One Fast Move or I'm Gone with Benjamin Gibbard come straight from Jack Kerouac. A couple of hundred miles north of Los Angeles, there's a spectacular, wild stretch of California coastline where mountains tower over the Pacific: Big Sur. That's where author Jack Kerouac wrote his autobiographical novel of the same name. It's where he went after he had "come undone" and was trying to dry out from the ravages of alcohol. A new documentary, One Fast Move or I'm Gone: Kerouac's Big Sur, documents that time in Kerouac's life. Its soundtrack is by Jay Farrar (Uncle Tupelo, Son Volt) and Benjamin Gibbard (Death Cab for Cutie), an unlikely pair; they were so inspired by Kerouac's words that they turned it into a full-length album of the same name. One Fast Move or I'm Gone is really a song cycle, starting out with the train trip that Kerouac takes from New York to California in a song called "California Zephyr." "Some of the songs were written from the text itself," Farrar says. "I was just scanning the book and coming up with ideas, but 90 percent of the words are Jack's." Kerouac has always been Gibbard's favorite author. Gibbard was in college studying to be a chemist when someone gave him a copy of On the Road. "In reading it, I got a sense of how I wanted my life to be," Gibbard says. "It certainly led me to the life of being a touring musician." At the peak of the book, there is hope. The words behind the song "These Roads Don't Move" come directly from Kerouac: "I'll get my ticket and say goodbye / Leave San Francisco behind / Go back home across autumn America / It'll be like it was in the beginning." "We all pine for a time in life when things were simpler," Gibbard says. "Even when they weren't necessarily simpler, hindsight makes them look a lot simpler. The reality of it was that it wasn't. We're not living in that moment anymore, so we look back with a bit of nostalgia." But by the end of the book and the album, the character is back in San Francisco among the drunks and the skid-row bums. It's a bleak way to end the story. "Jack set out to find himself and to be secluded. But it just didn't work out that way," Farrar says. "He found himself going back to San Francisco, bringing friends from San Francisco to Big Sur. But that's another part of the experience: Life on the road is essentially life intensified. The highs are higher and the lows are lower." In an interview, host Melissa Block wonders how Farrar was able to translate Kerouac's explosive, all-over-the-page style, especially in "Sea Engines," a poem at the end of Big Sur. "I've always identified with Jack's nonlinear approach to writing," Farrar says. "It's the idea that you don't worry about form or structure so much; you just get your first thoughts and ideas out there. I've always been able to relate to that and be inspired by that."